Both feared and revered by gardeners, the acid loving plants include popular garden ornamentals such as azaleas, gardenias, daphne, camellia, pieris and rhododendrons. Producing some of the most beautiful and wonderfully fragrant blossoms, these plants can be problematic for gardeners, as generally, they prefer a pH of around 5.5; this lower pH allows them to absorb the nutrients they require. Along with their particular pH requirements, these plants are sensitive to their microclimate and soil/water conditions. Acid loving plants can survive in soils with a pH range from 5 to 6.2 however prefer the pH to be between 5 and 5.5. You can use a home pH test kit to test your soil – pick one up at your local nursery. Soils that tend to be too alkaline or have a pH that is too high can be remedied by using the right selection of mulch and compost materials. A good solution is to use leaf mold; it tends to be acidic and breaks down quickly, making it excellent mulch that will also build the organic matter in the soil and lower the pH. If the pH needs adjusting there are many products available that introduce combinations of iron & sulphur into the soil to increase acidity and lower pH. As acid loving plants tend to require a soil rich in organic matter, mulches that break down have the added benefit of building the soil as they compost. Choose mulches like lucerne & pea straw. 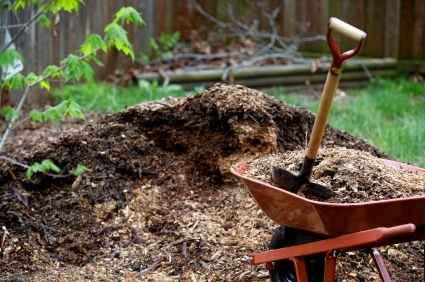 Using a long-term mulch like wood chips will require a separate program for maintaining the organic matter in the soil below and as the root systems of these plants are sensitive, is not ideal. 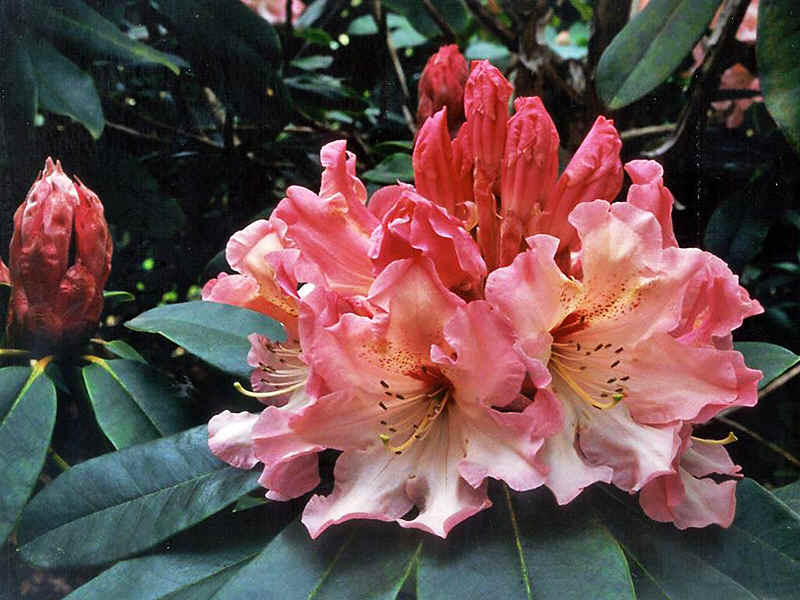 Rhododendrons and camellias have shallow, fibrous root balls, which need to be kept cool and moist. Regular watering is essential so choose a suitable watering system so either a well placed drip system or over-head system is preferred. Irregular, deep watering is not recommended as it causes the plants to drop their buds. Aerial sprays are an excellent choice for maintaining azaleas as spraying the underside of azaleas helps control spider mite infestations – a common pest affecting azaleas. Only ever prune these plants to shape or when hedging azaleas – otherwise it is not required. 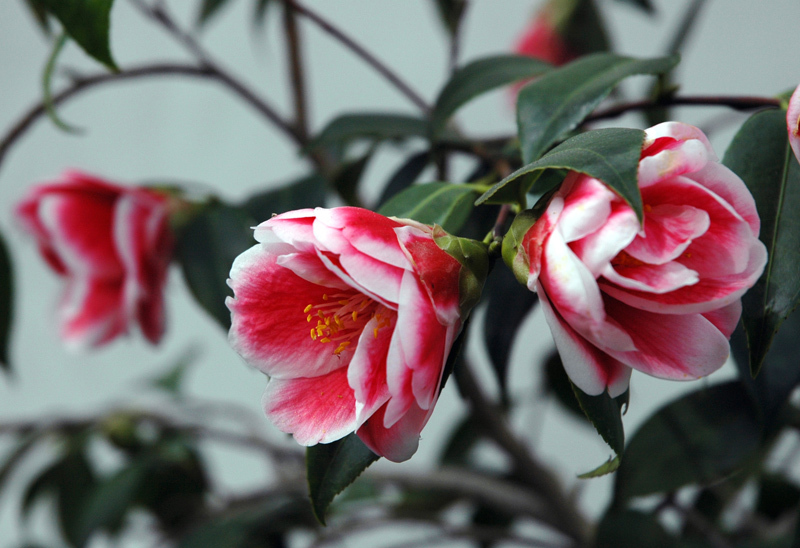 Disbud Camellia japonicas to improve the quality and size of the blossoms; remove excess flower buds along stems for optimal spacing and leave two buds at the terminus of the branch only. Rhododendrons can be deadheaded; take care not to damage the nodes beneath the blossoms on the stem otherwise there will be no new growth or flowers next season. This includes checking and improving drainage and amelioration. Improve clay soils by adding organic matter and using gypsum or clay breakers where necessary. Sandy soils can be built up with the addition of organic matter. To increase flower size and vigor of the japonica camellias, remove excess flower buds along stems for optimal spacing and leave two buds at the terminus of the branch only. Gone are the days of running the sprinkler during hot, lazy summer afternoons. Residential irrigation systems are becoming an essential management tool to maintain our gardens while supporting water saving initiatives. One of the key steps to designing your irrigation is to understand the water requirements of your plants and the natural attributes and deficiencies of your site. Conditioning soil and mulching will maximize water retention and should be considered an essential element of your ‘irrigation system’. 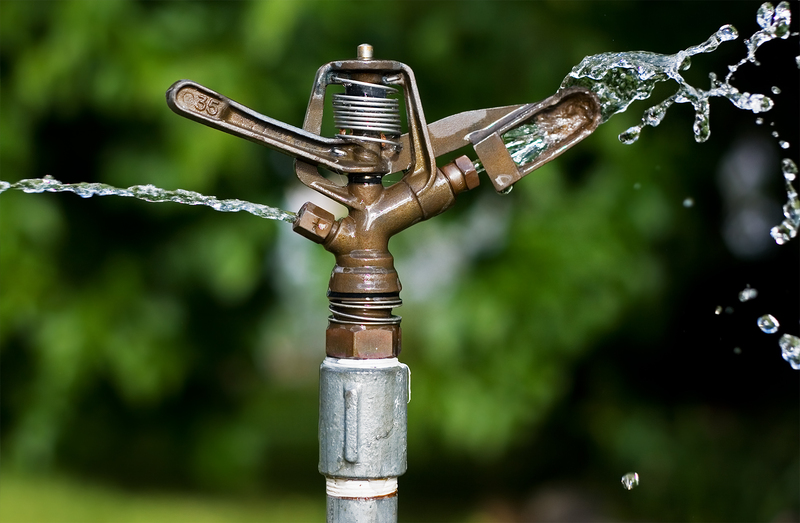 Primary hydro zones include turf, entranceways and formal beds as well as vegetable plots – these types of gardens require regular supplementary watering. Secondary hydro zones include established ornamental beds with shrubs and small trees that require routine but minimal supplementary watering. Minimal hydro zones are those that require little or no supplementary watering. As well as helping you choose the right type of irrigation, these zones can also be used to manage your overall irrigation system, including a schedule for soil improvement and rebuilding mulch. Pops up sprinklers – excellent for turf as they are submerged when switched off so do not create a hazard or incur damage. Not great for garden beds as vegetation can interfere with spray. Fixed spray sprinklers – installed on risers in garden beds, these can be set to a fixed radius or pre-set arc so maximize efficiency. These work particularly well in garden beds with established plants and fixed requirements. Rotator nozzles – can be installed and rotate in a sweeping arc. These work well to cover large areas but are only effective in calm weather conditions. Drip irrigation – the most water efficient irrigation system for garden beds. Minimal water loss through evaporation, no interference from weather conditions. All spray sprinklers lose water due to weather condition and evaporation. The other essential component of your irrigation system is the system sensor and computer – these are small devices either fitted to the main tap head or fixed to a wall or fence. The system sensor measures rain, soil moisture and evapotranspiration and transmits this data to the system computer. The system computer regulates the timing and flow rates to your garden. You can have single or multiple hydro zones with varied timing and flow rates for the perfect soil moisture balance. 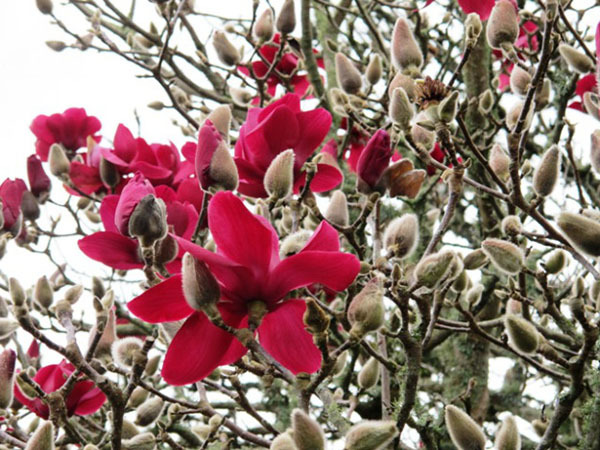 Heralding the coming of spring, Magnolias, especially the deciduous varieties hold a special place in the hearts of many a gardener with their stunning displays of large, fragrant blooms on elegant naked branches. Originating in Asia there are over 100 species and unnumbered cultivars. They are well adapted to Australian conditions and provided you give them a good position and adequate food and water they will reward you for many years. 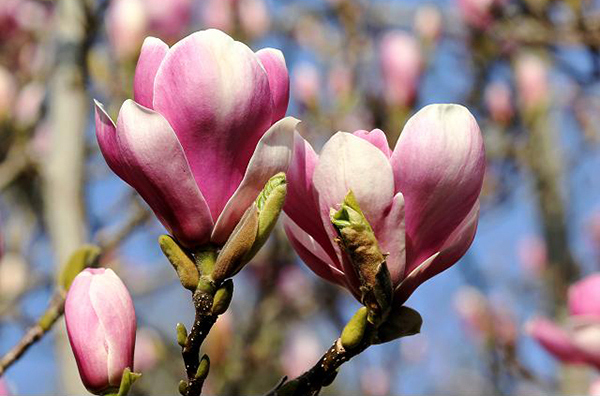 Magnolias can be a little sulky for the first few years so feed them well when you first plant them with a good compost, build a well around the base of the trunk to direct water into the root zone and mulch well to keep the roots moist and cool. Choose a north or east facing position with shelter from hot winds and frost. Magnolia x soulangeana cv. 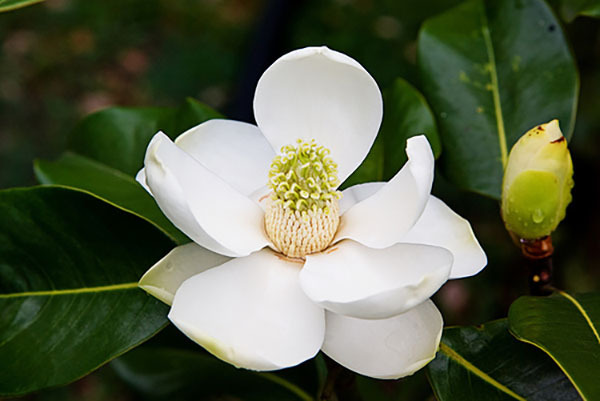 3m X 3m; one of the old varieties and the basis of many cultivars Magnolia x soulangeana is perhaps the most common Magnolia seen in Melbourne gardens. Magnolia stellata 1.5m X 1.5m; a slow-growing medium-sized deciduous shrub of broadly rounded habit, flowering in early spring. 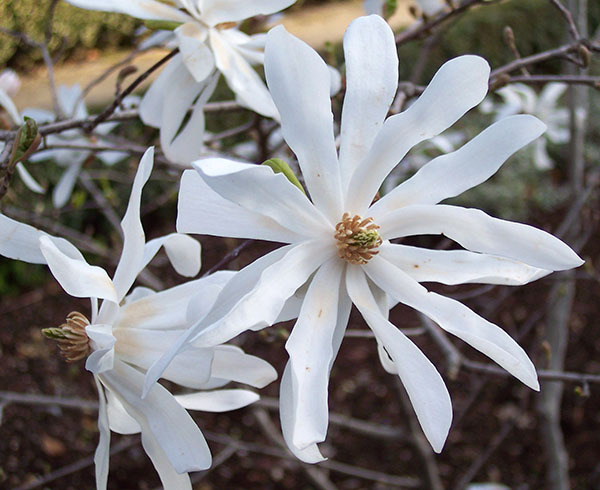 This Magnolia is particularly stunning because of it fine white petals. 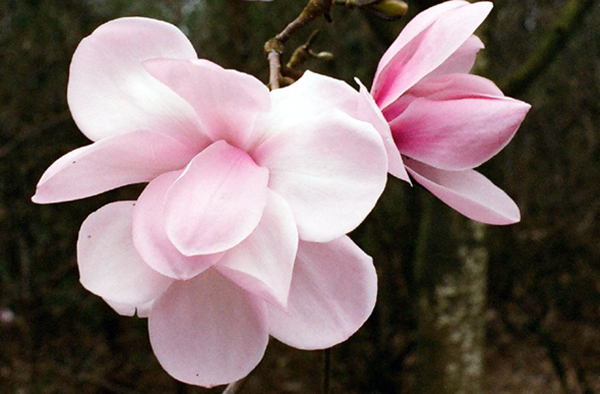 It also comes in a pink variety Magnolia stellate rosea. Magnolia ‘Caerhays Belle’ 7m X 5m; a very narrow, fastigiate shape, excellent for a small garden because it needs almost no pruning and has a beautiful fragrance. 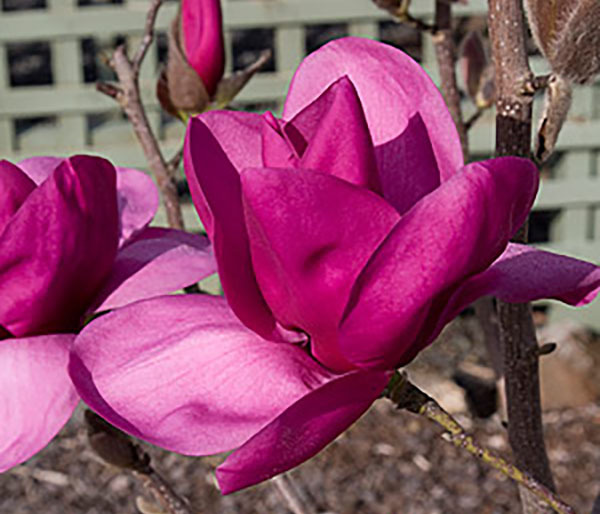 Magnolia ‘Phillip Tregunna’ 5m X 3m; an upright tree, with a vivid purple flower and a beautiful fragrance. Magnolia ‘Ruby’ 3m X 2m; a beauty because of the beautiful, exquisite shape of the bud and also a white edge around each of the petals. Does well in a smaller garden and can be pruned to shape. Magnolia ‘Vulcan‘ 3m X 2m; a hybrid raised in New Zealand. The flowers are large, wine red and lightly perfumed. 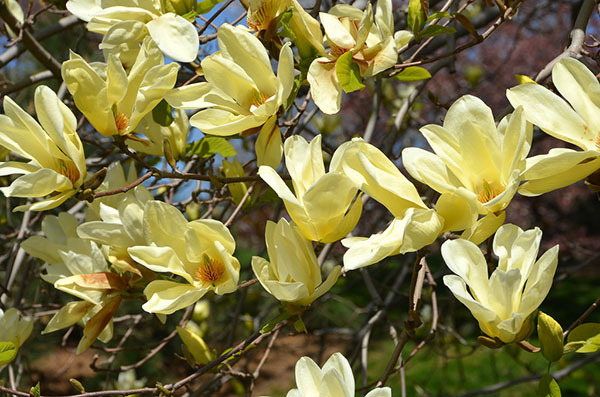 Magnolia ‘Elizabeth’ 4m X 2.5m; with perfumed primrose yellow fading to cream coloured flowers. 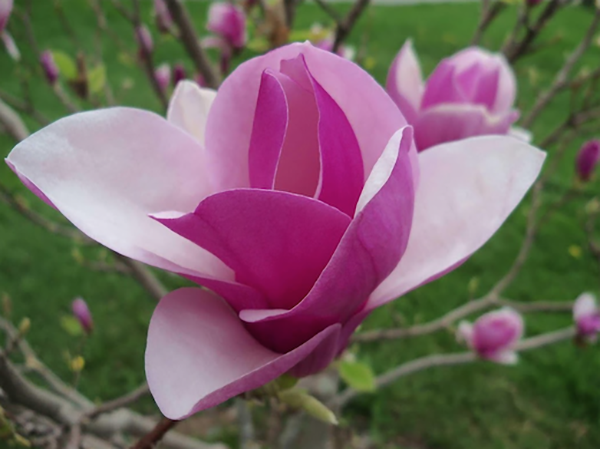 It is later flowering than other magnolia varieties blossoming in late spring. 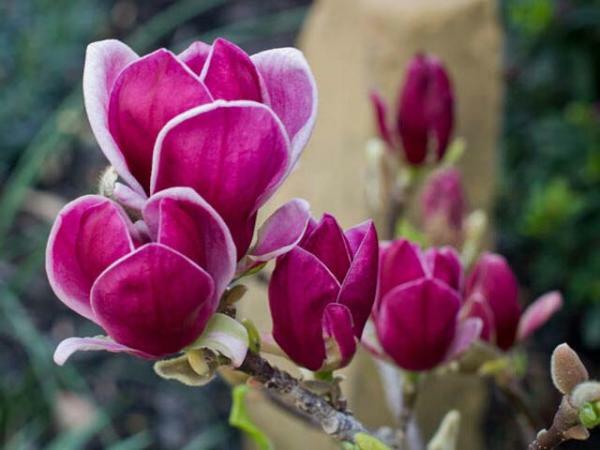 Magnolia ‘Royal Purple’ 3.5m X 1.2m; a beautiful new magnolia from New Zealand; a narrow yet stunning column with 20cm cup and saucer shaped blooms, dark red purple with a gorgeous perfume. A great choice for a small space. 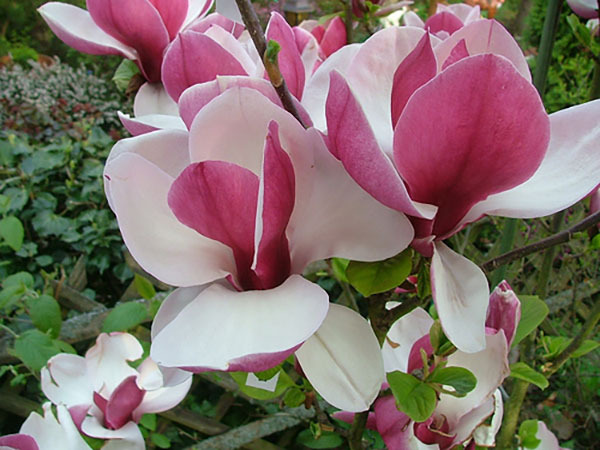 Magnolia ‘Little Gem’ 5m X 2.5m; a very popular plant used as an ornamental lawn tree or as for screening and even hedging. 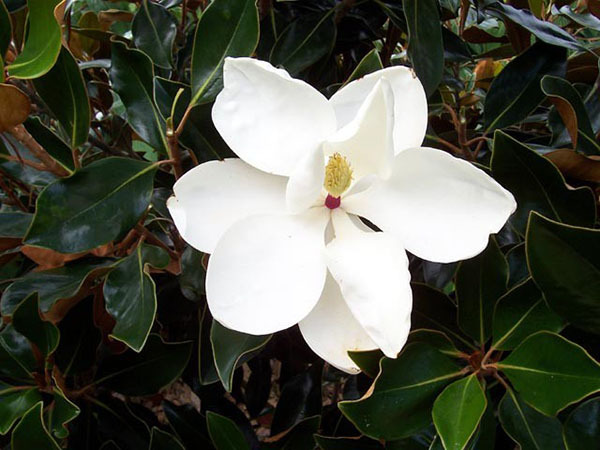 It is an outstanding variety of Magnolia grandiflora with a compact habit, deep green discolourous leaves and large white blooms. Magnolia ‘St Mary’ 6m X 3m: A wider growing variety with large glossy apple green leaves. It is a hardy and versatile plant that will tolerate a range of conditions and is relatively pest and disease free. During the warmer months it produces beautiful, creamy-white, fragrant flowers and will flower from an early age. In our climate, mulching is one of the most sensible, cost effective treatments you can apply to your garden for all round positive results. 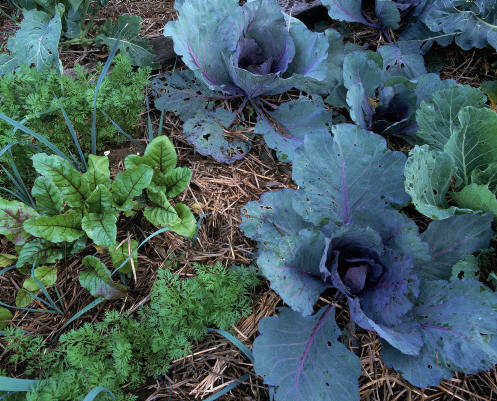 Using the right mulch and using it the right way, can reduce the need to water by up to 60%, improve soil conditions, help minimize the need for manual weeding or herbicides and nourish your garden. Your options for mulching are organic and inorganic. The inorganic mulches are pebbles, scoria and gravel – these should be used judiciously as they can be a challenge to maintain in some situations. Organic mulches range from lawn clippings, leaf litter, cubed mulches, baled lucerne or pea straw to the hardier composted bark mulches. Organic mulches are your best option for overall garden health; as they slowly breakdown they encourage microbial activity and worms, which in turn nourish and oxygenate the soil as well as adding organic matter and improving soil structure. Good mulch will secure moisture in the top layer of the soil and discourage weeds, which compete with plants for nutrients and water. Lawn clippings and leaf litter are a handy option, however are better put to use in the compost, as they are yet to breakdown. 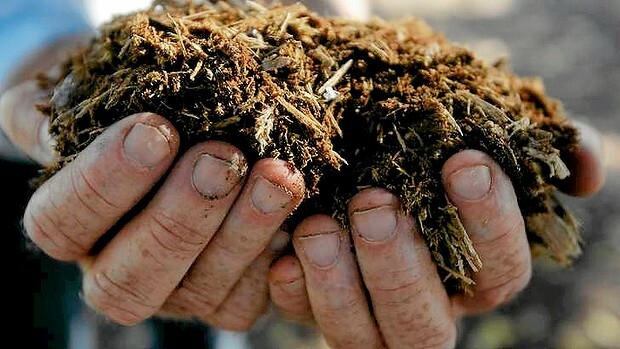 Using them as mulch can have the unwanted side effect of reducing the nitrogen in your soil, as the little microbes that will do the composting require nitrogen to go about their business. This is called nitrogen drawdown and anything that is not fully composted before adding to the garden can have this effect. It can however, be easily counteracted by applying a good fertilizer. Cubed mulches, which are a chopped pea straw or lucerne, are easy to spread but will soften and break down quickly so are excellent as soil conditioners but not a mulch with any long term prospects. Baled lucerne and pea straw are another great option, especially in productive garden beds as they supply all the benefits of good mulch but can be easily dug in to the soil at the end of a season to add essential organic matter. They are also inexpensive, easy to come by and easy to handle. Ordinary hay should be avoided, as it will invariably carry unwanted seeds. If you are going for the bark mulch option, always choose composted bark mulch and select the grade or ‘coarseness’ carefully. Fine grade mulch can actually act as a barrier to water as it compacts and can also form a seedbed for unwanted weeds. The mulch should be medium to large grade and spread up to 7.5cm deep. These larger particle mulches allow water to trickle through to the soil and do not compact over time. Most of the bark mulches available to us are by products of the pine industry, which is an advantage, as these products tend to acidify the soil as they decompose which is great, as most plants prefer a neutral to lower pH soil.